Looking at Emma’s recent oeuvre of landscapes it is evident that she is in complete agreement with Hockney. We are treated to bold sweeping brushstrokes and arches of colour (some of which is laid on with a knife) and a luscious colour palette. I take a lot of photographs of things that inspire me, particularly when I’m walking my dogs every morning – Salisbury Plain, Collingbourne Woods, Chute Causeway and Marlborough Downs are all my surrounding landscape inspirations. Often, I will drive around in my Land Rover with charcoal and sketchbook to find ideas. I then use these as a starting point for new work; the painting evolves from there and can often take on a whole new meaning or composition. I love to draw and firmly believe that it helps to create a stronger painting and understanding of the composition. Do you always paint ‘en plein air’ or is it a bit of both? For me, painting outside is not terribly practical as I’m a very messy painter and I like to mix up a big (not easily transportable) palette of colours before I start work. I don’t rely on any “real” scenery but use my imagination and reaction from what I’ve observed. Can you give us an idea of a typical day? There is no such thing as a typical working day for me. That said, the morning always begins with an hour’s dog walk after which I will deal with some boring domestic/administrative duties. Usually, by 10.30am, I can be found in my studio with a cup of coffee. Some days can be slow and unproductive and any distraction is welcome … I might end up tidying or preparing surfaces to work on. Other days can go very quickly and I really enjoy myself. If I don’t have to cook supper in the evening I am sometimes still there at 8pm. What can’t you live without in your studio for a day of painting? Coffee, Classic FM, Radio 4 and my three dogs lying on the studio sofa along with lots of drawings, photographs and cuttings to inspire me. 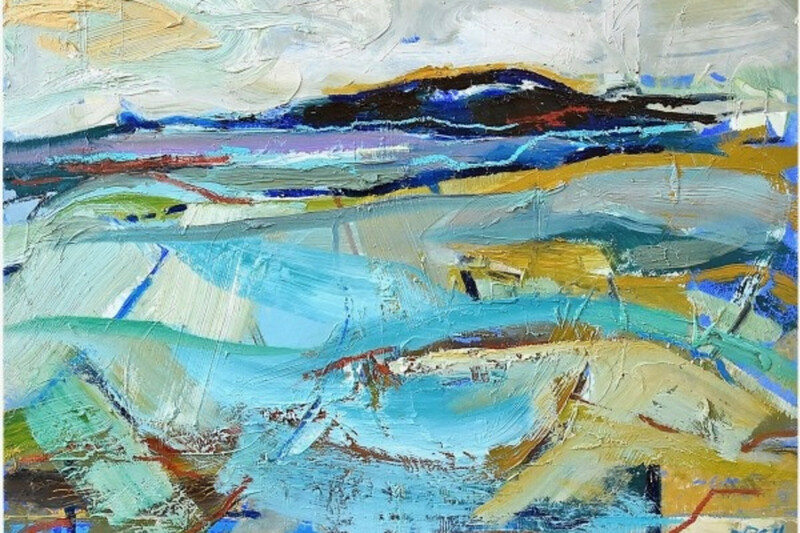 I like to look and learn from a large collection of art books that are scattered about – Rose Hilton, Keith Vaughan, Ben Nicholson, Ivon Hitchens, Richard Diebenkorn and Joan Eardley have all taught me so much about colour combinations and palette choices. And finally, what first inspired you to paint? As a child I loved to draw and paint; I tried very hard but never had any work selected for the BBC television programme ‘Vision On’. My father and I would often walk around the Cornish coastline and villages with sketchbook, camera and binoculars in hand. Whilst at Homerton College, Cambridge I was fortunate to have had two wonderful years of weekly life drawing and painting on huge homemade canvases. It was at this point that I thought maybe I could try to be a real painter. More recently, I have met and worked with some great artists who have inspired and encouraged me – most especially my tutor and friend, Robin Child. He’s opened my eyes to so many contemporary artists, taught me how to read a painting and, most importantly of all, encouraged me to paint with energy and confidence.